Four miles of road walking. Doesn't sound a great day out, but I'm not the only one trudging the tarmac along the Arisaig coast road. At each small bay and cove, people with cameras and binoculars peer expectantly out to sea. And with good reason … this is one of the UK's otter hotspots. The sun is shining – particularly fiercely for a Scottish May – and the sea lochs are shimmering, bright against the peaty brown headlands and islands. It's a particularly fine stretch of coast, even set within the fierce competition of the west coast. And the tourists are flocking to this corner of the country – business in Mallaig has apparently boomed since the West Highland Railway started promoting day trips to the town from Fort William. The train journey through the highlands is rightly the major attraction, and with ninety minutes to kill in Mallaig (no easy task, I can tell you) they pack into the tea rooms and pubs. After an hour of waiting, it's clear the otters aren't playing ball. Flask empty, newspaper fully browsed, I set off along the coast road again. At Millburn Cottage, I cross the stile and head along the deer tracks to Cruach Doire an Dobhrain, the high point of the Arisaig peninsula. As summits go, it's pretty modest – 103m. But the ground is rough going, with no tracks and plenty of heather. After an appreciative gaze at the Rois-Bhein hills to the south, and Rum and Eigg out at sea, I pick my way through the knee-high heather towards the coast, and the peninsula's more reliable attraction – the remote bay of Port nam Murrach. If this striking bay was on England's south coast, it would have the full works – pubs, tea rooms, gift shops, overflowing car parks. Fortunately, it's 40 minutes away from the nearest parking spot, which seems to be sufficient to keep most people away. 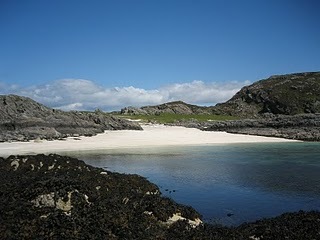 Revelling in the solitude, I lie back on the sand and doze for an hour as the waves lap against the surrounding rocks. Balls to otters, this is the only way to spend a treasured sunny day in Scotland. Returning via the cow-created track past Rhue Cottage, I get my wildlife spotter's badge for the day – a buzzard circling over Cruach Doire an Dobhrain, with lapwings bobbling about in the nearby field. Heading back along the coastal road, several otter-spotters are still patiently sat by the shore; but for the furry beats are still proving elusive. I head past them towards my tent in Keppoch, via the restorative comforts of the café in Arisaig. Even in May, Scottish evenings are long, and for those under canvas there's little chance of sleep much before 11pm. 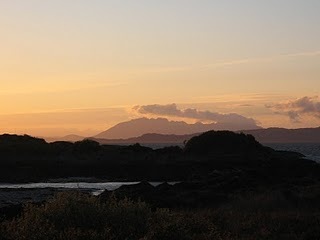 But a long evening is no hardship when my campsite overlooks the islands of Skye and Rum. With the scarlet sun setting behind them, they looked perfect. If I was a Tweeter, I could have made lots of people envious at once, but as it was, I made do with a few texts before heading for the tent and the stove. Various cafes in Arisaig (although based on my experience, I would avoid the Rhu café). There's also a small supermarket. Several campsites around Keppoch – take the track past Keppoch house just north of Arisaig and follow the coast around to the campsites. 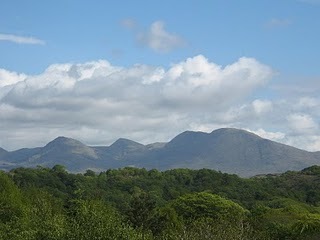 Trains between Fort William and Mallaig stop at Arisaig, ten minutes from the village centre. There are also local buses that call at Arisaig.